A Barista in Khartoum ? OK ! For those who skipped geography classes, Khartoum is the capital city of Sudan – the largest country by surface area in Africa and the city where the longest river in the World, the River Nile flows through as one. enough about geography and back to coffee, which I am assuming you enjoy. I recently had the opportunity with work to visit Khartoum for a few days and of course, I did some previous research before hand to find out if it was possible to get some coffee from any reputable cafes, et voila ! (French for Eureka ! or Hey ! 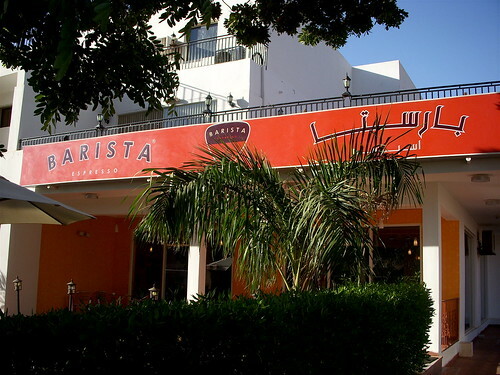 what do you know) the famous Indian coffee chain, Barista, opened their first shop in Africa in Khartoum, Sudan in 2008. Barista are naturally big in India but are also making a name for themselves in Dubai (see my post of 5 September 2008), so despite a very busy schedule, I manage to stop over for a late lunch at the Barista Cafe in the posh part of Khartoum, called Riyad, not far from the airport. The shop is housed in a large villa and is quite spacious with air condition of course. There’s also an upstairs and an outside garden, which I assume would be ideal in the evening if you are drinking ice cold coffee drinks, because the average temperature for winter is around 26C (around 80F). They also have satellite TV is available on large flat screens dotted around the shop. It’s a popular place for foreigners and the rich Sudanese to hang out, with an espresso costing about $4. As it was the first time I was having anything that resemabled coffee on my trip, I first ordered an Espresso Macchiato to get that espresso fix with a dash of frothed milk. As someone who takes their coffee seriously or as a bit of a coffee snub, as my wife calls me, I ignored the barista’s advice to sit down and wait for my coffee, insisting rather that I would like to watch. Well ! what do you know, after watching the barista tamp my freshly ground coffee weakly, I called out and said something like ” Hey ! you need to tamp with a bit more pressure than that please, etc….”. The lead barista, who I later found out is based in Dubai and from Nepal, saw that this was a bit of a serious customer and decided to take over. The good thing about Barisat with regards to variety is that they try and source and serve beans from all over the planet and so during my visit, they were serving arabica beans from Cuba. 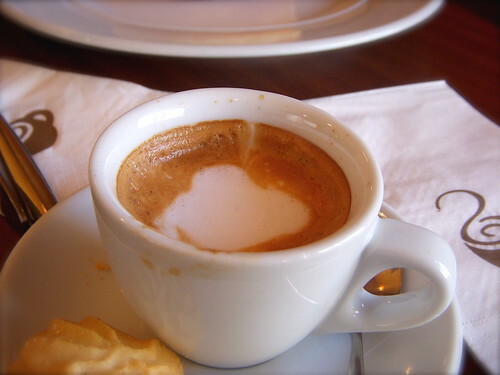 Now how’s that for a line “I’m drinking Italian espresso macchiato made with Cuban arabica coffee in Khartoum, Sudan” – now didn’t I say coffee was the drink of the escapist. Anyway the coffee was abit bold in that it had a full taste and the frothed milk just complimented it. But ! as this was probably going to be my only chance of getting coffee within my 4 day stay, I thought ” I would like some more coffee” after all an espresso macchiato is like an appetiser for those of us who drink doppios (double espressos) all the time. So I decided to order just straight coffee to accompany my chocolate doughnut. This time, I was able to sample the real taste of the Cuban coffee, which was strong and so I defintley got my caffeine fix. I planned again to visit in the morning to try and get a take-away cappuccino but wasn’t successful in my endeavours. In any case, if you do happen to go to Khartoum or know someone who is going (more likely as they have many United Nations staff there), then recommend the Barista Cafe for that little bit of escapism. 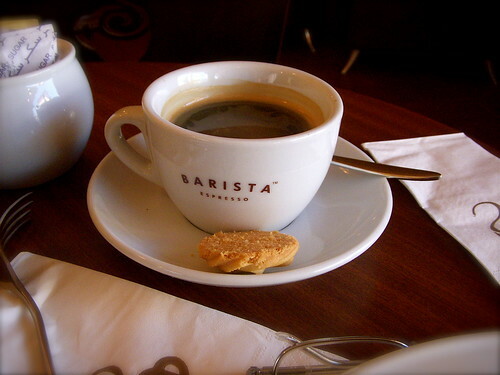 This entry was posted on Thursday, December 11th, 2008 at 11:02 am	and tagged with Barista, Bean There - Cafes, Khartoum, Sudan and posted in Bean There - Cafes, Coffee News. You can follow any responses to this entry through the RSS 2.0 feed. « Light a Candle for…..